Posted on July 5, 2017 by Greg Kaz. You love your RV, and you want it to last for as long as possible. As your RV gets older, though, you know there will be certain inevitable repairs and maintenance that you need to do to keep it in good running order. You need to make sure the engine is working properly. You need to have fresh oil, and you need to be sure the tires are in good shape. One of the things that you tend not to think about until it is too late is the roof. However, if you suddenly found out that you had leaks in your roof, what would you do? If you are like many RV owners, you would panic. You would start imagining just how much it would cost to take the RV to a professional for repair. It might be more than the RV is worth, and it could be more than you can afford. However, you do not have to imaging this doomsday scenario. Instead, consider using RV roof coatings instead. These coating could be just the thing your RV needs to take care of those leaks. What Are the RV Roof Coatings? These are elastomeric coatings that are applied to the top of your RV like paint. They can be rolled on with rollers and brushes, or they could be sprayed onto the roof. The coating is a type of rubber that creates a shield between the roof and the outer elements. It means that the leaks will vanish, so you can keep your RV in good shape for a lot longer. These coating are so popular that many manufacturers today have them on the new RVs they sell. As someone who owns an older RV, it makes sense that you would want to add the RV roof coating, as well. Fortunately, it is easier and more affordable than you might think. You do not need to hire a professional to apply the coating to your RV. You can take care of the entire project on your own. This can save you a substantial amount of money, and it does not take too long to apply the coating, either. Since you are only covering an RV, you should be done in no time at all. As soon as you have applied the coating, the waterproofing aspect of it goes to work. Even if it were to start raining right after the application goes on, it will still provide protection for your RV. 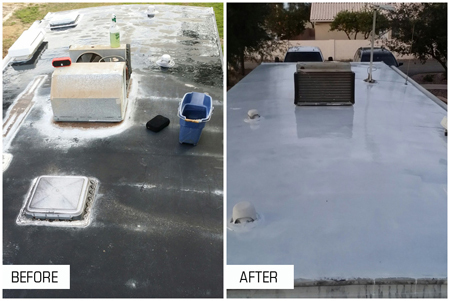 After you clean the roof of the RV, you can make repairs to flashing, vents, and other areas if needed, and can then apply the coating with a roller or a sprayer. Whether you have noticed a leak or not, the RV roof coatings can be a fantastic investment for your RV. Having the coating will ensure you do not have to worry about leaking, or damage from UV rays. It is a nice solution all around. This entry was posted in Liquid Roof, Roof repair, RV Roof Repair by Greg Kaz.. Bookmark the permalink.